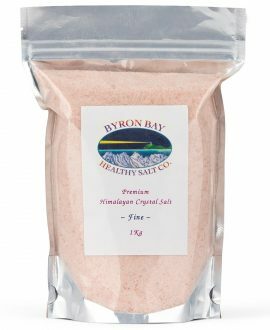 Himalayan Crystal Salt Shake - Fine Salt 125g NET - Byron Bay Healthy Salt Co.
Great For: A refreshing, full flavoured 100% pure & natural healthy salt to add to all your everyday foods as an alternative to regular salt. About Himalayan Salt: For detailed information about this incredible salt go to our Salt Benefits page. Aniseed Myrtle Leaves – has one of the highest concentrations of Anethole, the compound which gives it the aniseed flavour and aroma. Native Basil – is a good source of vitamin A, which helps to prevent damage to the cells by free radicals. Native Thyme – is a natural medicine used for treating chest and respiratory problems. Native Mint – is a good appetizer and promotes digestion and soothes stomach indigestion and inflammation. Sea Parsley – is a good source of Vitamin C, Sodium, Potassium, Beta-carotene, Magnesium and contains more iron than spinach. Australian Mountain Pepper Berries are unlike other peppercorns. They add a spicy bush tang with a fragrant fruity aroma & contain 3 times the antioxidants of blueberries. Our Australian native Pepper Berry comes from the rainforest regions of Tasmania. It’s believed the Mountain Pepper Berry contains anti-microbial, anti-fungal properties and holds the worlds strongest antioxidants. Research is showing the nutrients in Mountain Pepper Berry have polygodial properties which act as a protection for the stomach wall, have anti-inflammatory, anti-asthmatic and anti-allergic benefits while reducing sensitivity to pain activities. It has been traditionally used by the Aboriginal people as bush medicine. Great For: All your favourite foods, a delicious, tangy & healthy alternative to your everyday salt & pepper. 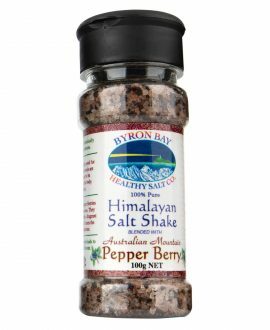 Ingredients: Himalayan Salt Crystals blended with Australian Mountain Pepper Berry. Our Lemon Myrtle comes fresh from the Byron Bay hinterland rainforest. Not only does it have intense, unique lemon flavour & aroma, studies show it can aid in strengthening the immune system. Lemon Myrtle leaves contain the highest amount of citral of any plant known in the world .